I generally do not cook very spicy food as overuse of spices tends to mask the flavour or character of certain foods. So, for me to make a detour from my general cooking practices the dish in question needs to be phenomenal. 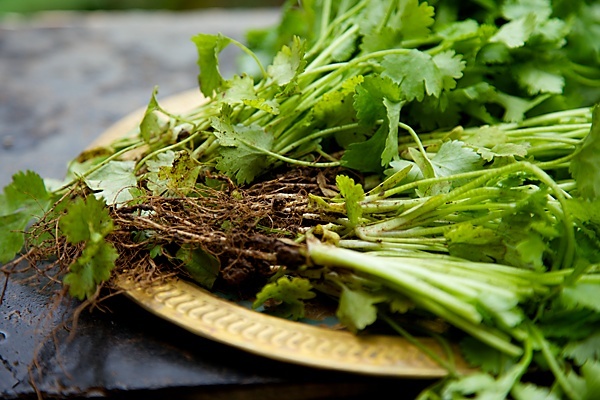 Like this chutney made with fresh curry leaves and coriander. 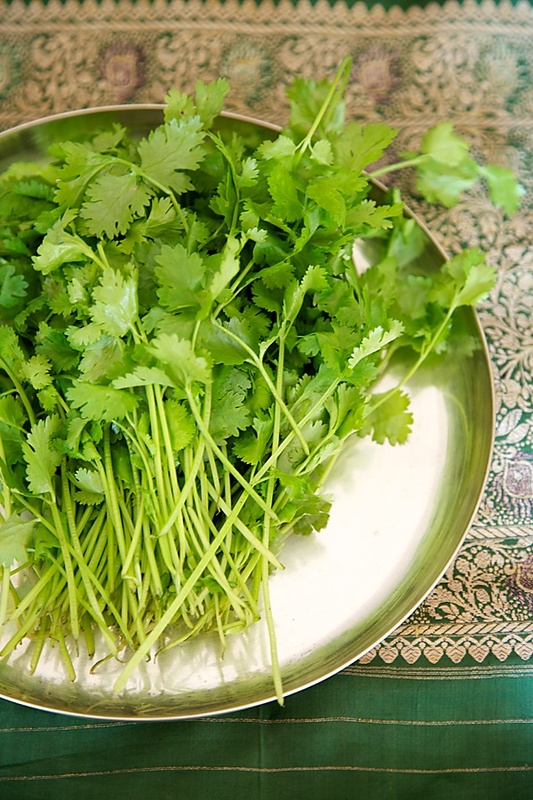 And since I�™m on a much needed break visiting my parents, I had access to fresh curry leaf and coriander grown by my mother. To tell you the truth, I had no intention of making this chutney. But, when my brother expressed a desire to eat something spicy, I remembered this chutney which the husband had relished and gone upto the extent of declaring that he could brave Mumbai traffic and travel long distances to come home to a plateful of hot rice and this chutney. I would normally serve this with some papads, hot rasam and a vegetable dish, but this chutney is so good that one can make a proper meal with it by just mixing a spoonful of it with some hot rice and a dollop of ghee to get a taste of traditional south Indian cuisine. 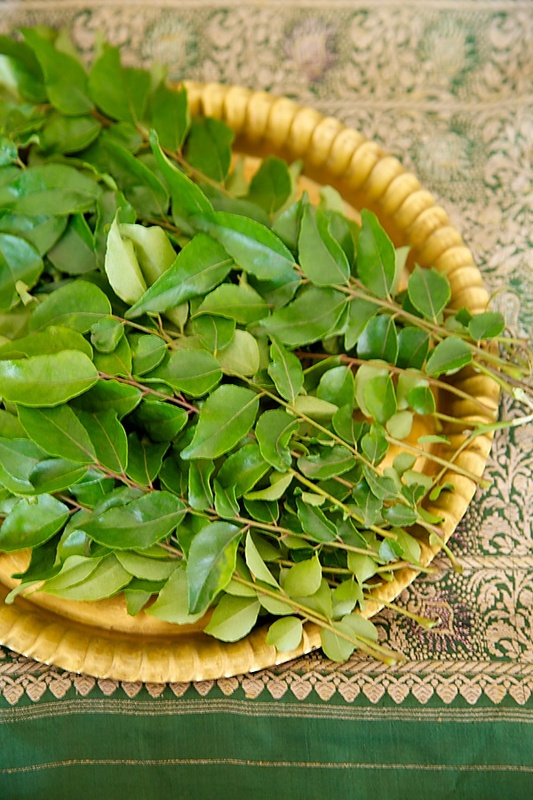 Curry leaves, which are also supposed to be power houses of nutrition and good for many parts of the human body are an indispensable part of my cooking and I will not dare to make a south Indian dish without them. There was a time when I used to even force myself to eat them raw, considering the health benefits. Not being a huge fan of fresh coriander and using it only in places where it is absolutely necessary and in most cases always cooked (cooking coriander eliminates that raw smell which I�™m not a fan of in some dishes and adds flavour to the dish), I was surprised with the flavour of this chutney when I first made it, more with the intention of feeding it than relishing it myself. This is a staple now and perfect to add zing to any bland or otherwise lackadaisical food. I have tried it with dosas, appams, rice, chapati and bread and have not met with disappointment. 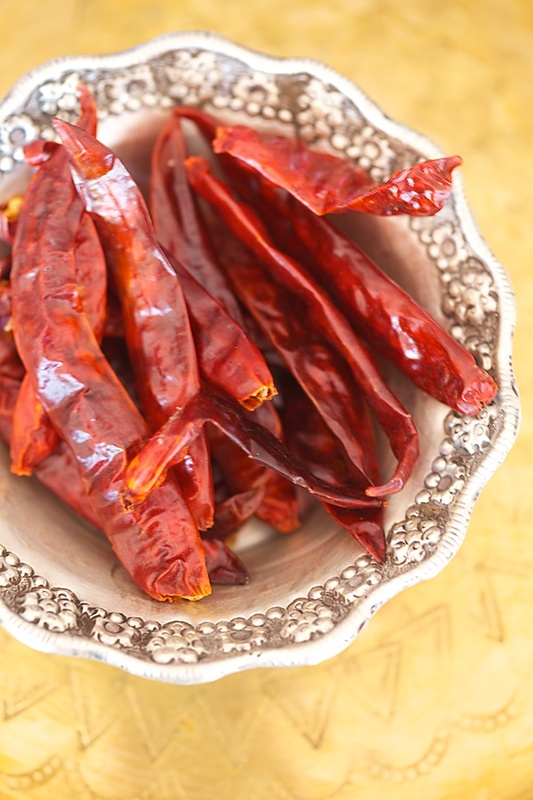 If you are looking for a spicy addition or accompaniment to a meal then this is it. The plus side is you could even eat it as a main course if you are not up to it to cook a full meal. All you have to do is mix it into some hot rice and a little sesame oil or ghee to be in complete bliss. 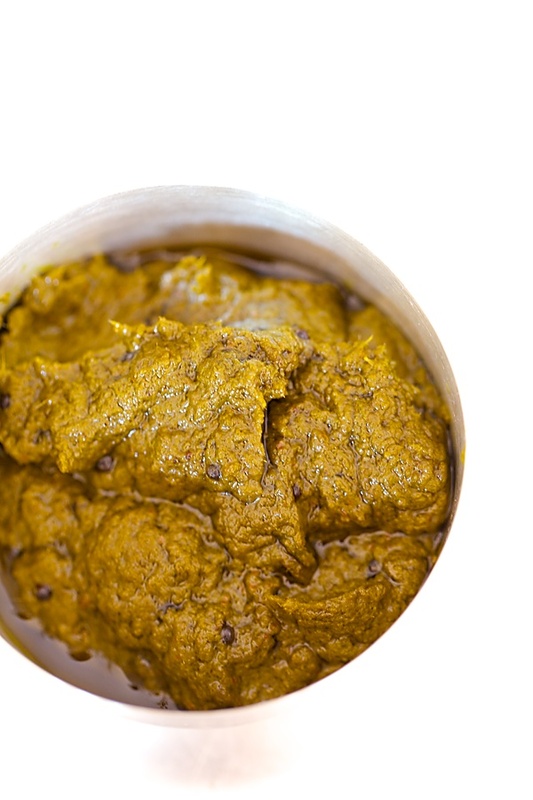 In a blender put in all the ingredients for the chutney, the curry leaves, fresh coriander, ginger, pepper, red chilies, asafetida, tamarind, salt and grind to a fine paste using a little water approximately 1/4 cup to 1/3 cup. In a wok or a saucepan heat the oil for the seasoning, put in the mustard seeds and when they pop, stir in the ground paste and cook on low heat until the raw smell disappears and the chutney is well cooked. Serve with some hot rice and papad or as an accompaniment with other rice and bread dishes. Can be stored in the refrigerator for 3 to 4 days. A pleasant surprise to see your name on this week's ET mag.. The article on Laal Maat was instructive. Hi Anushruthi, I am a regular reader of your blog and I love it! I tried this chutney recipe today and it tasted absolutely fantastic. I wanted to know how we can be sure that chutney is well-cooked. Should I wait for oil to float on top? I just love your blog and check almost everyday. I shall definitely try this chutney.. Please answer my quetion on saftey of food cooked in microwave oven. Hari is so cute. I have a son who is 5 years and his name is pranav. Please post some receipies for kids lunch box. Thanks for sharing the recipe. I love curry leaves. Lovely recipe Anushruti. I am seeing 12 red chilles and also 1 1/2 tsp of black pepper! That must make it HoT! Loved the clicks as usual! A simple chutney makes a meal so much more delish, though I would not mind a meal of just bisi anna, saaru and loads of palya anytime! 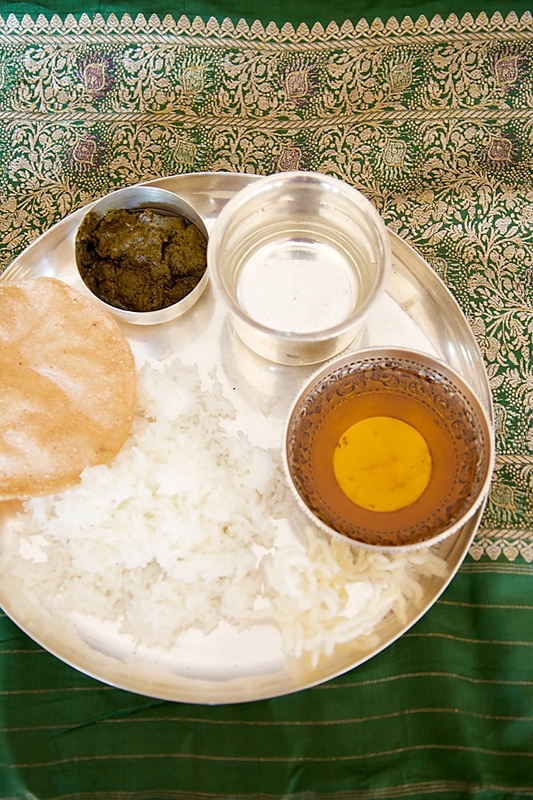 My mother makes karibevina chutney with urad dal and copra, yours sounds fab too! Beautiful pictures.. The chutney looks so very mouth-watering. It's nice to have a fresh chutney recipe. Thanks for sharing. It's lovely. SC: Yes..that' a good indicator. Roopa: Thank you for your interest. I never use a microwave oven as its safety is under question. Nice to know that you have a young son too. Will surely try and post kids recipes. suppamani645: Nice to know that this everyday chutney is offered to forefathers in Kerala.